This is supposed to be a sailing blog. 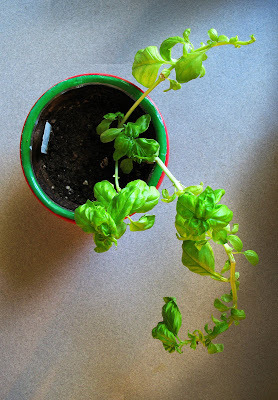 What does a stupid basil plant have to do with sailing? OK, nothing, but other serious bloggers get away with posting about their basil plants and nobody takes them any less seriously for it. Bonnie recently posted about her basil plants and dozens of people commented. She went on to talk about all of the plants in her garden, but frankly, I wasn't too interested in those. When I got to the picture of the basil, I just went all ga-ga. There was this verdant patch of basil, overflowing its bed, even after Bonnie had picked off leaves for some salads and for - get this - pesto! Damn, she even makes her own pesto! I just stared at the photo, this sick feeling at the pit of my stomach. You see, I've had this quiet crusade running in my kitchen for the past couple of years trying to get basil - any basil - to grow. You may have guessed by now that I'm not big into horticulture. I don't believe in fussing with plants too much. I do this kind of tough love thing with them. They get a pot, a place in the sun, and a reasonably regular water ration. That's it. After that, they're on their own. I don't have the time for any mollycoddling. And most plants in our kitchen have bought into the program quite nicely, thank you. We have a gaggle of 'Christmas Cacti' that put out this unbelieveable bounty of red and pink flowers every year. I've never understood how they know it's Christmas. Our nearest calendar is in the next room, where they can't see it. But the Christmas Cacti are definitely happy campers. Not so, my basil plants - most of which are long departed. They seem content enough for a few weeks. Some have even made it a few months. But eventually, they all start looking like the one in the photo there - a few scrawny twigs, some wilting leaves, and a gloomy aura of impending death hanging over the pot. I know what's about to happen. I'll come home from work one day, and there will be the crumpled remains of an ex- basil plant. No note, or anything. I usually bury them in the back yard, but lately I think some of the neighbors are getting suspicious. I'm starting to think the basil get some sort of nervous disorder living in the kitchen. That is, after all, where we do the cooking. They see all of the grinding and shredding and chopping that happens to their fellow basil leaves. For them, it must be like living on death row. Maybe Bonnie's right. I guess I should move them outside. But then they'd see the burial grounds. Look, matey, I know a dead basil when I see one, and I'm looking at one right now. David and Tillerman, I wish you could show a little more sensitivity here. You have no idea the anguish I've been through, seeing basil plant after basil plant taken from me so young, in the very prime of life. I have hope for this one. It's been lingering like that for weeks now. It may be in remission. It's not in remission. It has passed on. This basil is no more. It has ceased to be. It has expired and gone to meet its maker. It's a stiff. Bereft of life. It rests in peace. You know, I was warned that bloggers can be cruel. I knew I'd need to be tough to weather the hard times. I'm digging down deep, now. I'll get through this. Gone to meet the choir eternal. I've lost a considerable number of basil plants. Two already, just this season. This last is perhaps my one remaining chance this year for some truly fresh basil. Can I get no support from the blogging community on this? Must you all make a mockery of my grief? Maybe you could try putting the basil on the telly. Only if the penguin doesn't mind, of course. Three dead basils in one year!!! Seriously. Some people should not be allowed to keep basil. It's two dead basils. This one's in remission. The penguin on the telly, admittedly, didn't do at all well. 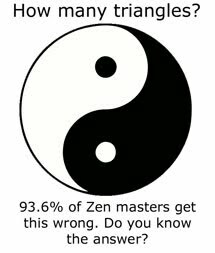 Seriously, take up something easier like being a peacock herder on O Dock. You are clearly not cut out to be a basilisk. Hmm, Mr Google tells me a basilisk is "a legendary reptile reputed to be king of serpents and said to have the power to cause death with a single glance." Maybe I've just been looking at the basil plants too much. This could also explain why my autopilot runs OK as long as I don't look at it. OK. OK. Make fun of me if you must. I used the wrong word for a basil farmer. I meant to call you a basilary. 'Basilary' is an adjective, not a noun. I suppose you could correctly call me basilary, but not a basilary. And, since I'm trying to keep basil, one could also say that I'm basil retentive. It is merely waiting for the right combination of nutrients, water, and sun. I think you're right, Panda. Posts like this prove that I'm not spending enough time sailing. I just realized, this blog post was only just slightly off on the timing ... October 5, 1969, was the debut of the television show Monty Python's Flying Circus. We should have had a grand 40th anniversary celebration. I think you're right, Carol Anne. Instead of posting about my basil plant, maybe I should have posted about my shrubbery.